A fence is serves as much more than a barrier, it also adds aesthetic value to any property, residential or commercial. For a new homeowner or business owner, it may be difficult to choose the right material for your functional and aesthetic needs. When installing a fence on your premises, it is good to know all the options available, as well as knowing all the pros and cons of each material and style. The following are some useful fencing material tips and ideas. Vinyl fence in Chesterfield style and Sierra Blend color. Can you tell that this is not real wood? 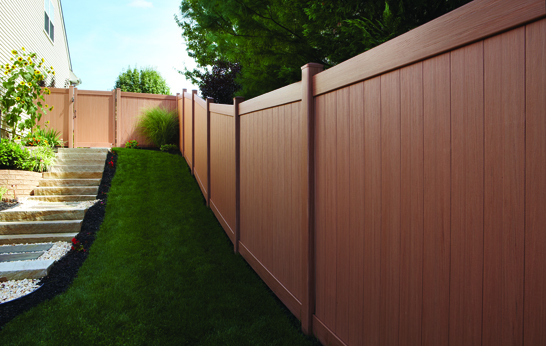 Vinyl fencing is gaining popularity with homeowners due to its durability and beauty. 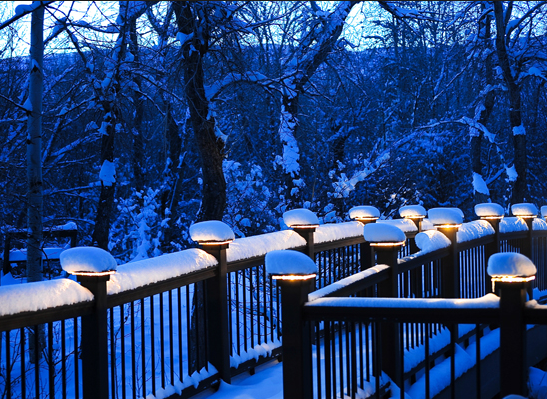 It is made of polyvinyl-chloride, which is a material that is durable to harsh weather such as snow or sun rays. Even with continued exposure to the weather elements, it can last for amazingly long periods of time. Vinyl also comes in CertaGrain which imitates wooden fencing, in terms of color and texture (pictured above). With a vinyl fence, all that is needed is the occasional spray down with a hose if it were to ever become muddy. 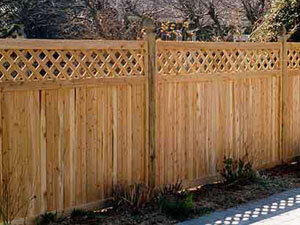 A vinyl fence is also really cheap to install. 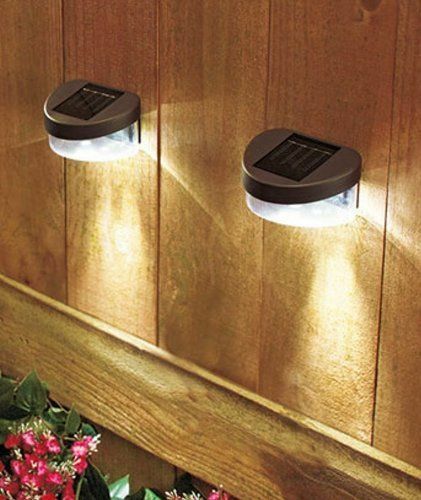 Unlike wood, vinyl will not rot or attract unwanted bugs to your home or yard. Wood fence with lattice on top. The most common type of wooden fencing is the picket fence. This has been used in most American homes, usually painted white. Wood can attract termites and is also susceptible to mold. In Michigan the life of wood may be shortened because of extreme temperatures, most notably, snow. 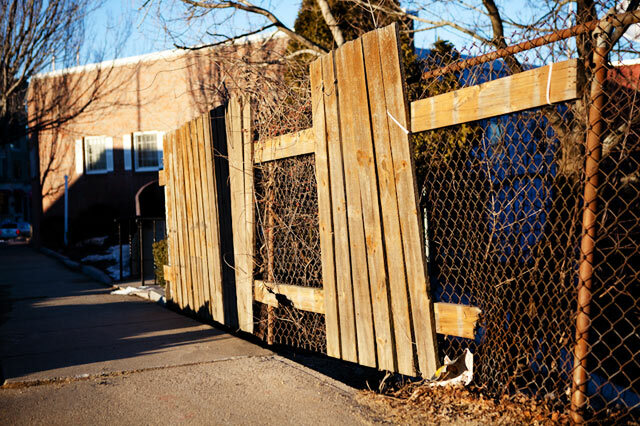 If you live in an area with some insecurity, you may want to consider getting a stronger type of wood, preferably a higher privacy fence, so the intruders keep out. 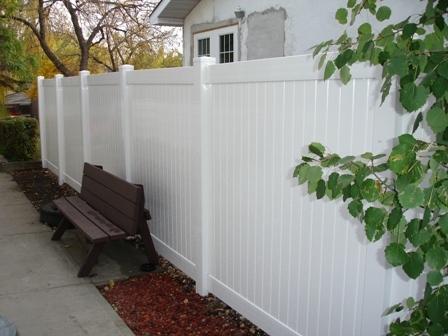 A cheaper and durable alternative is vinyl fence, which also does not attract termites. If you are looking to have the same look and feel as wood, vinyl fence comes in CertaGrain which mimics wood color and texture. Black vinyl coated chain link fence. Chain link fences are the most versatile, and they blend in easily with any building. They are quite cheap, perfect for those who are carrying out construction on a tight budget. If you want privacy then slats and/or mesh can be added to chain link to make it less see through, if privacy is a concern. If you do not like the metallic silver, chain link also comes in vinyl coated colors, which is pictured above in black vinyl coat. Vinyl coated can be paired with mesh or slats. 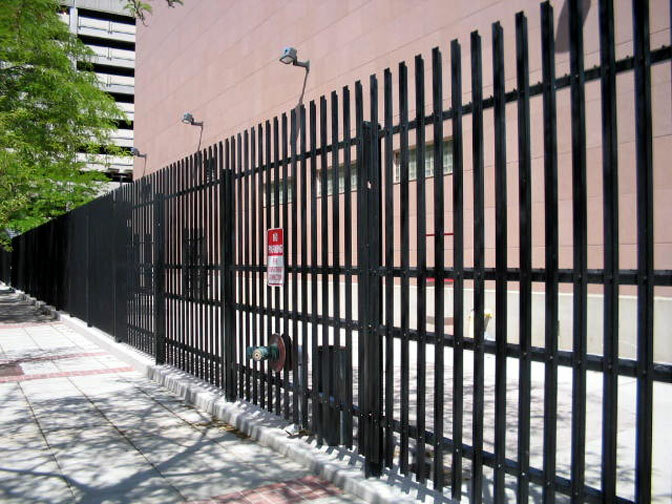 Steel fence on a commercial property. Aluminum and steel are known for their durability and stability. These type of fences are still found today in homes that are hundreds of years old and still standing, strong and sturdy. With aluminum and steel, there are many different styles and colors to choose from, depending on preference. the fence’s theme can blend really well with any style of home or business, so if your home or business has a theme, it is guaranteed that there is an aluminum or steel style to match! The aluminum and steel fence may not be suitable for people who value a high level of privacy, since it does not shield the residence from the prying eyes of strangers. 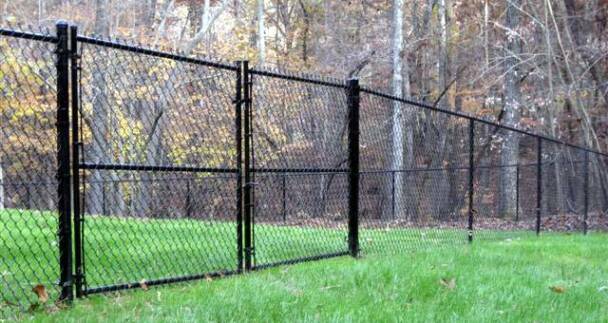 However, if you live in an area where there are many pets, these type of fences can hinder the ability of animals (or people) that want to sneak into your compound and wreak havoc. Whichever fencing idea you go with, remember to compliment the style of your property. 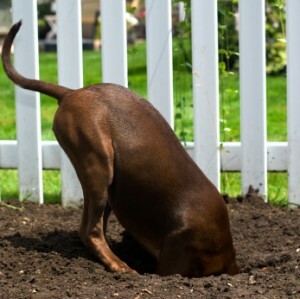 When constructing a new home or business, pay attention to the kind of fences used by the people in the area and see if anything catches your eye or if you want to stand out.